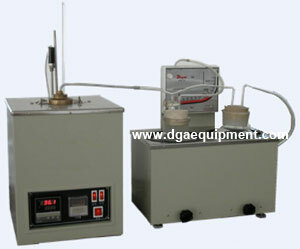 Measures the evaporation loss tendencies of lubricating oils at certain temperatures by the Noack method. A quantity of 65g of a lubricant is placed in an evaporative crucible and heated to 250°C for 60 minutes. The evaporation loss tendencies of the lubricant are determined by passing a constant air stream over the heated sample by means of a vacuum pump. Conforms to ASTM D5800 and SH/T 0059. Evaporative crucible is made of fully aluminum alloy. Heating is more evenly and reliably. Digital temperature meter controls temperature automatically. Timing device alarms automatically.